Last month, we took a family vacation to Florida. This was a big trip for the kids. They've been on many family vacations before, but this was special in that it was the first time on a plane for both of my kids. We were really concerned as to how Zach would take the trip. 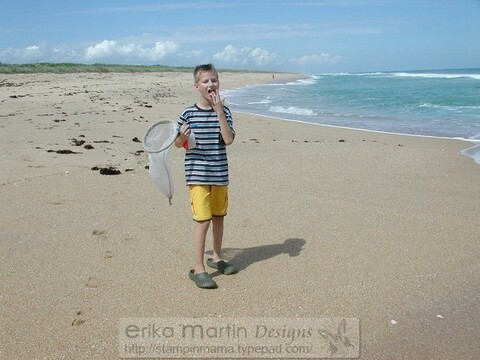 He was excited about all the bugs he would find in Florida, as it's been cold here and his favorite insect, moths, have been few and far between. His bug jars and net go with him everywhere. Zach hates elevators. It's definitely a sensory thing for him. He doesn't like that weightless feeling. We were concerned that the feeling of a plane lifting off and touching down would set him off. One of the best things about living in northern Vermont is that just about everything is "small town" and friendly. Our airport was awesome about setting up a field trip day for us to come up and walk through the process of checking in and boarding. We spent an hour at the airport and got to walk through the baggage area, onto the tarmac, through security, into the security room to see all the computers and monitor screens, behind the check in counter.....we were taken good care of and by the time we left, Zach was very comfortable with the thought of flying. We spent a couple days at the beach and, even though there weren't many bugs to find or fish to catch, Zach makes sure the bug jars and net go everywhere he does. Ya know, just in case. Zach is not the type of kid to go running into the waves. He's cautious of water. The small pool in our backyard was okay with him. Not the ocean, though. It's too unpredictable. It took us over an hour to coax him to take off his shoes and socks at the ocean. He finally got brave enough to touch the foam on the beach as the waves broke up and receded back. I thought that was really cute.....and then I realized what he was doing with the foam. 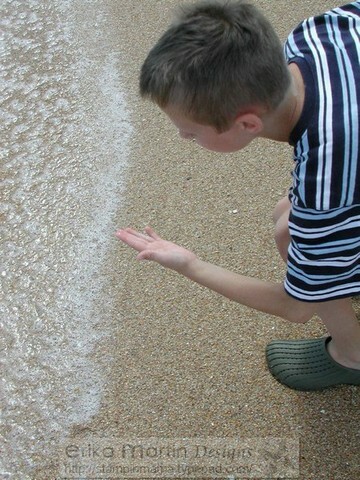 He would run up to the foam and bend down to touch it with his fingers....making sure that he got some of the foam bubbles on his hand. Then he would back away before the next wave came up to break on the beach. He would touch his fingers to his mouth to taste the foam. I asked him what he was doing and he said, "It's salty!" Apparently, he was fascinated by the fact that salt water really DOES taste like salt! The plane trips were wonderful! Zach did AWESOME! No problems whatsoever. Chad, our coordinator, even created a great social story for Zach before we left and I think between that and the field trip, it made for an amazing experience for everyone. Oh....and if you have a chance to ever fly with JetBlue, they're AWESOME! They were very attentive to every need that we had and they checked up on us throughout the flight. We even got to pre-board and the kids got to go in the cockpit, meet the pilots and get their "junior wings." One of the attendants even made sure to walk all the way down to our connecting gate to let them know we needed special attention. Zach thought the little TVs on each seat were cool, especially because he could keep track of the progress of our plane on the map, as well as the speed and altitude. It was an awesome vacation and now the kids can't wait for another flight somewhere! Erika that is just wonderful and heartwarming to hear! I am so glad it was a smooth experience not to mention FUN fun FUN for all of you. How proud of Zach you must be! Sounds Good..Your tour is looking to be very enjoyable. I always love to read such type of post. Good Work ! Keep it up Erica ! !